What I didn’t write about was the four big fish earlier in the week that didn’t end up on the end of my line. The one that spooked as soon as I raised my rod, the huge one I didn’t see until I almost stepped on it, the one that spooked when I landed the fly on its forehead or the one that had a smaller fish next to it that ate the fly first. Bonefishing is as much an art and luck as it is technique, somehow knowing which way the fish will turn or when he has eaten a stationary fly. Entire books have been written about flyfishing for bonefish so this short article will just give you just enough information to be dangerous! 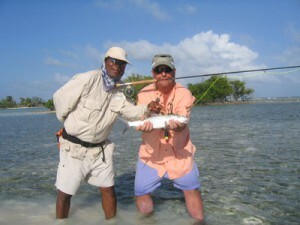 There are three general parts to hooking a bonefish; seeing the fish, casting to it, and enticing it to eat. Zen and the art of bonefish spotting.. A bonefish’s mirrored scales reflect their surroundings so well it is almost always difficult to see them. The easiest way to learn to see bonefish is to go out with a guide in an area that has lots of fish to practice on. With his help you will learn to spot them much more quickly than on your own (although my first bonefish was without a guide). Each time you see a fish memorize the look, another fish that comes from that direction will have the same look. Each time you release one follow it away for as long as possible. Each time you spook one follow it away. Try to focus on the bottom of the flat rather than the surface of the water and scan for anything that might be a fish. Once you have a target keep your eyes glued on that area and watch for movement, bonefish are on the move 99% of the time. If it doesn’t move it’s not a bonefish! The fish are easiest to see when they are pointed directly at you with their slightly darker back more visible. Rarely do you see an entire fish, just some movement or a shadow or the slight glow. If you think it’s a fish, cast! The key to spotting fish is practice. If you are out on your own you will probably spook lots of fish before you see them, think of it as practice. Sometimes when I am on a flat without a guide I will wade quickly until I spook a fish or two and then slow down. I know there are fish in the area and I have seen the “look” they have on that flat on that day in those lighting conditions. To increase your odds pick a shallow area or a sandy area and just wait, patience will give you the best chance to see fish. In fact on cloudy days all I do is search water that is less than 10″ deep so that I can see a tail, or a wake to identify the fish. Even after years of bonefishing and guiding I can be standing in one spot scanning the water 40 feet in front of me only to glance down and see a bonefish swimming casually 5 feet in front of me – how did it get there without me seeing it? Now that you can finally see a fish let’s cast to him. There will be 3 categories of fish to cast to, cruising fish, slowly moving zigzagging fish and active tailing or mudding fish. Cruising fish are not eating they are simple traveling to the next feeding station. Very often schools of fish can be found cruising in areas like Ascension Bay, Los Roques, the Bahamas and Christmas Island. 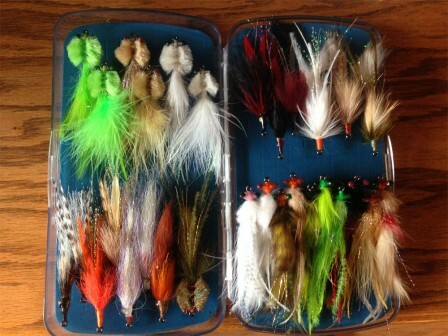 Most of these fish will eat if presented with a free meal. Since a cruising fish is moving fairly fast you need to get that line out quickly, it is more important to fire it out fast with a pretty good cast than to false cast till its perfect. Since cruising fish will generally move in a straight line you can lead the fish by quite a margin, lets say 10 -15 feet. You can just leave our fly motionless until the fish is close enough o see the fly. This over leading is the easiest way to avoid spooking a fish. A zig-zagging feeding fish may have a general direction (usually into the current if there is one) in which it is moving in but may move back and forth and change that direction at any time. A quick cast isn’t as important here but you can’t afford to lead by too much ( the fish will surely change directions) but you can’t land it too close either. Again guess the direction and lead by three to four feet or so, wait till the fish approaches the area of the fly and then strip. If you guessed wrong you can be patient and hope he zigs back towards your fly or take the risk of recasting to a newly calculated (guessed) direction. A tailing or mudding fish has tunnel vision and is looking straight down much of the time. 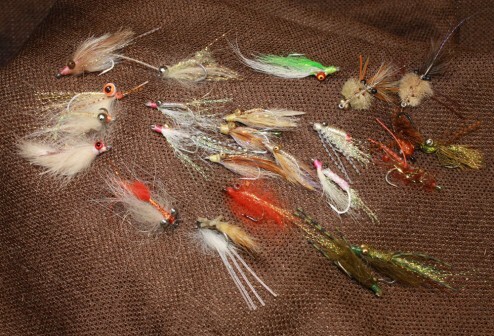 Here you want to put the fly right on top of the fish with very little leading. A fish with current on the flat will sometimes almost hang there feeding like a trout as food comes to it. Sometimes when they are feeding heavily in an area they will stir up enough mud so they can’t see well so again cast right in front of his nose. 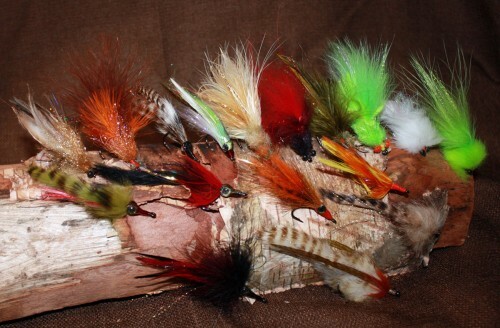 If your fly is heavier, lead the fish by a larger margin. The perfect cast is one that hits the water sinks to the bottom and then fish swims calmly right over it. It’s almost a guaranteed hookup. Rule 6 – You will usually guess wrong! Rule 8 – Do what your guide says regardless of what you read here! Once the fish is on, all hell breaks loose. Try your best to clear the line as it rips through your guides and finally gets on the reel, and try to keep the line off coral or mangrove shoots, so don’t be afraid to run after the fish to keep it clear! Equipment tips – You will definitely appreciate a large arbor reel, the bones will reverse course faster than you can – get abrasive resistant tippet like flouro carbon and go as heavy as the fish will stand ( 12 – 15 pounds is OK in Christmas Island while 8-10 pound is needed in Ascension Bay).